Congratulations to Inbee Park, your 2008 U.S. Women's Open champion. Two weeks shy of her 20th birthday, Inbee is the youngest winner in the history of the tournament. Golf for Women magazine this month has an article about Paula Creamer's love of fashion. The photo above is from the article. Check out the shoes. They add about 8 inches to Paula's height. They look like the spaceboots worn by members of Kiss. Read the article. Say hello to the women of Highway 18 (from left to right): Ashleigh Korzack, Ashley Davis, Keri Murphy, Jameica Duncombe and Charlotte Campbell. What is Highway 18? It's the newest "reality golf" series from the Golf Channel, and it premieres on July 22. It will air for 10 episodes in the 10 p.m. (ET) time slot on Tuesday nights. Think of it as "The Amazing Race" for golfers. The Golf Channel explains "the contending teams ... will race down Florida's highways, fairways and byways spanning more than 1,000 miles over 10 weekly episodes. The contestants will compete in challenges both on and off the course that will demand cooperation and ingenuity in order to survive elimination." Each episode of Highway 18 will feature three sets of golf challenges: a Start Challenge, a Road Challenge and a Clubhouse Challenge. Murphy will kickoff each episode by revealing the Start Challenges to the contestants, ranging from tests of skill or trivia on golf courses, beaches or a swamp. Road Challenges can comprise either quick stops – such as target practice at a highway driving range – or well-known, but non-traditional settings, including Daytona International Speedway, Florida Field and Donald Trump’s ultra-exclusive Mar-a-Largo Club. Clubhouse Challenges will take place at various golf destinations, ranging from famous championship venues – including TPC Sawgrass, Innisbrook and Trump International Golf Club – to municipal facilities off the beaten path. Teams will be eliminated if they finish last in two clubhouse challenges (double elimination). Keri Murphy is familiar to Golf Babes readers as the video host on GolfNow.com. The other women pictured above are the four female contestants on the series. (There are guy contestants, too, but hey, this ain't Golf Dudes!). We'll be featuring each of these contestants and telling you more about them as the premiere date draws closer. For now, watch the video trailer. Golf Babes never requests or collects any information from our visitors, and we never require our visitors to register. However, some of our partners may collect information on visitors such as identifying a visitor's geographic location through his or her IP address. These partners may be our third-party statistics service, an advertising partner, or our Web hosting provider, for example. Golf Babes' authorized agents automatically receive and record certain "traffic data" on their server logs from your browser including your IP address, Golf Babes cookie information, and the page you requested. Golf Babes and its partners use this traffic data to help diagnose problems with its servers, analyze trends and administer the website. Many companies offer programs that help you to visit websites anonymously. While Golf Babes cannot provide such a program for you, we want you to be aware that these programs are available. Golf Babes is very concerned about your privacy and should you contact us via email we pledge to you that your email address will never be shared with any other partner without your explicit permission. Cookies are alphanumeric identifiers that Golf Babes' partners may transfer to your computer's hard drive through your Web browser to enable their systems to recognize your browser and tell them how and when pages in our website are visited and by how many people. The cookies used on Golf Babes do not collect personal information, your screen name or e-mail address. Our Wilhelmina 7 post of the day is Mikaela Parmlid. It makes sense that Wilhelmina would want to sign Mikaela - she's a player who always makes interesting (and sometimes unusual) fashion choices). Mikaela is a Swede who played collegiate golf at the University of Southern California. She studied economics and graduated in 2003 - the same year she won the NCAA individual championship and USC won the team championship. Mikaela's rookie season on the LPGA Tour was 2004, when she had non-exempt status. She has maintained membership since then, finishing 86th and 84th on the money in 2006 and 2007, respectively. She is 95th so far on the 2008 money list, through 11 events. 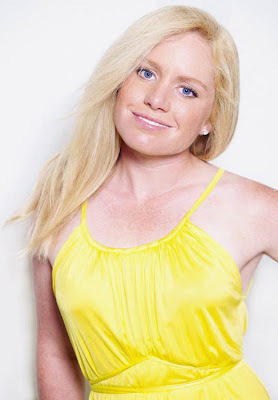 Kim Hall is one of the "Wilhelmina 7," or W7, the group of seven LPGA Tour golfers who've signed with Wilhelmina Artist Management, a division of the famed Wilhelmina Models agency. Kim is a graduate of Stanford, where she majored in American Studies, and where she was a three-time all-conference selection. 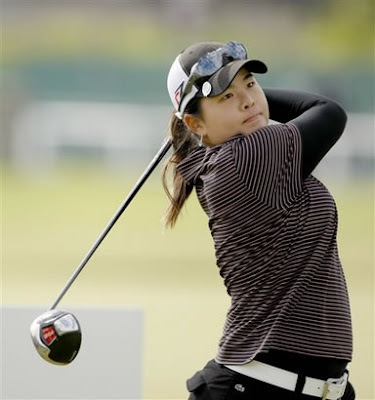 She first earned non-exempt LPGA status in 2006. Last year, 2007, was her first year as a fully exempt member of the tour, a designation she maintains in 2008. Last year Kim finished 76th on the money list, and had one Top 10 finish. Her second career Top 10 came earlier this year at the MasterCard Classic in Mexico. Kim's scoring average is down more than half a stroke so far in 2008 compared to 2007, and she ranks in the Top 20 in fairways through this point in the season. What is - or are - the "Wilhelmina 7"? The W7 is a group of seven LPGA Tour golfers who have signed with Wilhelmina Artist Management, a division of Wilhelmina Models. And Wilhelmina Models, of course, is one of the most-famous modeling agencies in the world. Wilhelmina Artist Management will "seek out sponsorship and endorsement opportunities for the women as a whole package and individually." The "Wilhelmina 7" are Minea Blomqvist, Sandra Gal, Anna Grzebien, Kim Hall, Johanna Head, Mikaela Parmlid and Stacy Prammanasudh. WAM states that the "W7 includes only those women with the game, the beauty and the personality to create a major presence in women’s sports, both on and off the course." Beautiful and athletically talented female golfers? Hey, that's what we're all about here at Golf Babes! So over the next few days we'll post a few photos of the W7, photos provided by Wilhelmina Artist Management. Stay tuned. The Natalie pic above is one featured on the Natalie Gulbis profile page over at AskMen.com. And kudos to our friends at AskMen.com (who once featured Golf Babes as their "Site of the Day") for including more golfers. They have pages now for Paula Creamer, Annika Sorenstam, Anna Rawson and Michelle Wie. And some guy named Tiger Woods. Although personally, I've never considered him very attractive. Click on the labels below to view more of these golfers on Golf Babes. When the final round of the Ginn Tribute began, Seon Hwa Lee was nine shots off the lead. When it ended, she was the champion. Here's something I wouldn't have guessed: Before Seon Hwa's win on Sunday, it had been 26 tournaments since a Korean golfer won on the LPGA Tour. That golfer was ... Seon Hwa Lee. She won last year's match play tournament.